Here is a challenging cryptolist puzzle that is sure to keep the brain healthy and active. 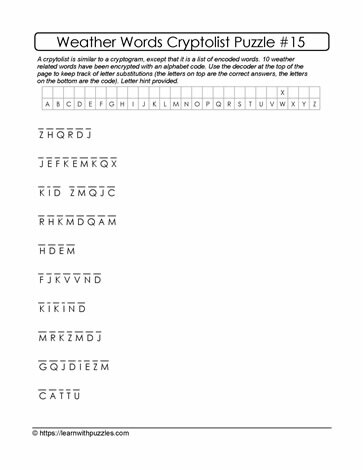 To solve the puzzle, each letter has been substituted with another letter in an alphabet code. The words need to be deciphered and the letter substitutions recorded in the table at the top of the page. Next, substitute all the known letters into the cryptic list to solve the puzzle. Puzzles support brain health and these puzzles are suited for ages Grade 9 and above. With differentiated instruction, have students in lower should be able to manage the solutions.